DES MOINES - The Iowa Barnstormers Head Coach and Director of Football Operations, Mike Hohensee, announced today that the team has been assigned quarterback Alex Carder, offensive lineman Jeremy Schonbrunner, wide receiver Brodrick Smith, and linebacker Tyrone Clark. Carder (6-1, 216, Western Michigan) joins the Iowa Barnstormers as a rookie after signing with the Detroit Lions of the National Football League as an undrafted free agent in 2013. More widely known for his standout career at Western Michigan, Carder ended his collegiate football career ranked third all-time in career passing yards with 9,116 yards. A natural leader, the Kansas native was recognized as an All-MAC player during three of his four seasons. Schonbrunner (6-3, 305, Temple University) enters his third season in the AFL after spending his first season in Philadelphia and second in San Antonio. Prior to his professional career, he played an outstanding four-year career at Temple University (2008-11). Making nine starts at center for the Owls, Schonbrunner was widely recognized for his physical play, but his spirit and enthusiasm earned him the 2010 Mark Bresani Award. 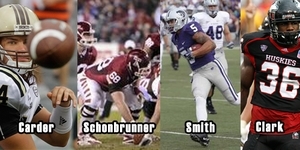 Smith (6-2, 218, Kansas State), who is entering his rookie season, was recognized as K-State's top receiver early in his senior year (2010), leading the team in catches, yards, and touchdowns before suffering a season-ending injury. Prior to transferring, Smith earned playing time in 12 games for Minnesota. Clark (6-0, 220, Northern Illinois), also entering his rookie season, was named the second team All-MAC selection his senior year (2012) and saw action in all 14 games, starting 13 at weak side for Northern Illinois. Clark completed his Huskie career with 178 tackles, 16.5 for loss, with 13 passes defended and 4.5 quarterback sacks. Season tickets are on sale now for the Barnstormers 2014 season for as little as $110 per seat. Season tickets make a great gift for the football fan in your family. So, don't miss a minute of the action this season! To order your seats or for more information, please call the Barnstormers at (515) 633-2255, or log on to www.theiowabarnstormers.com.